Juliette & Chocolat was where I finally decided to try the salty-sweet taste combination that’s so popular now. I had their brownies (beautifully dense) with caramel sauce and fleur du sel. Mmmmmmm. Thanks for joining the blog, Pippa. I absolutely adore the sweet salty combo. In the modest price range, Lindt’s dark chocolate with sea salt is a truly divine bar. And in the exotic, Paul A. Young’s sea salt caramel dark chocolate brownies from London are the ultimate. 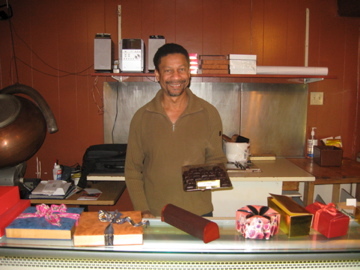 If you missed it, check out my post about Paul A. and other London chocolatiers at: https://diversionswithdoreen.wordpress.com/2011/06/22/surviving-londons-chocolate-revolution/. I will definitely try Juliette et Chocolat! Sounds like MY kind of place to have chats with friends. Thanks for the tip! 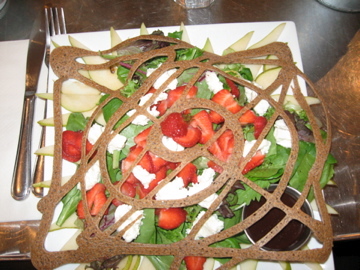 That chocolate salad looks amazing! What a quirky idea. Ah yes – two of my favourite things: Montreal and chocolate! Our mini chocolatour in Montreal certainly put us in the mood for that chocolate research trip, didn’t it? Les Chocolats de Chloé, 546 Duluth E.
Les Chocolats Geneviève Grandbois, 162 Saint-Viateur W.
Doreen, I’m in your yahoo group of Working Writers Club. My mom is from Montreal and I long to visit again. Now I know I must see this chocolate shop/restaurant. Say, Can you tell me how to offer my readers the opt in on my blog? It’s WordPress. Thanks to Kathe and Marlene for joining us here. 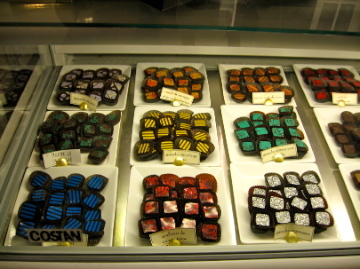 Kathe, I knew you’d have some great additions for Montreal chocolate lovers to visit. Thanks for sharing! And Marlene, yes, you’ve now got a great list of chocolate shops to visit the next time you see your Mom! Re adding “widgets” to your blog, just go to the “tools” section and it will list various widgets you can add to your blog. Good luck, and see you on the WWC listserv. Such fun research Doreen! I didn’t take in “chocolate-y” Montreal when I lived there. We are long overdue for a visit! Thanks for dropping in here, Angie! Yes, it’s really a shame that you missed the PWAC conference and a visit to Montreal. It was all terrific. Just wanted to alert you to something I found: child slavery in the African chocolate industry. Knowing your passion for social justice, I thought you might want to report on it. Hi Bruce: Thanks for the alert. I am quite aware of this situation. The good thing is that all the bad publicity has caused the situation to improve. Cargill, who owns the largest cocoa processing plant in the world (which happens to be located in Ghana) has spent millions of dollars converting their chocolate production to a sustainable model. For the purposes of Chocolatour, I do intend to try and focus on the positive, but I will certainly have a chapter on sustainable chocolate and chocolate cooperatives, differentiating them from regions such as the Ivory Coast where the issue of child labour is still a serious concern. I hope you’ll drop in here again soon. I knew you’d be on top of it, Doreen, and it’s good to learn that the situation is changing. I understand the problem lies more with the major commercial chocolate producers, not the boutique or speciality shops. From now on, I’ll be keeping an eye out for fair trade chocolate…and I would LOVE to see you write a chapter on the issue. Michael Pollen was drawn into the more political aspects of food production when he started writing about food. It’s all connected. 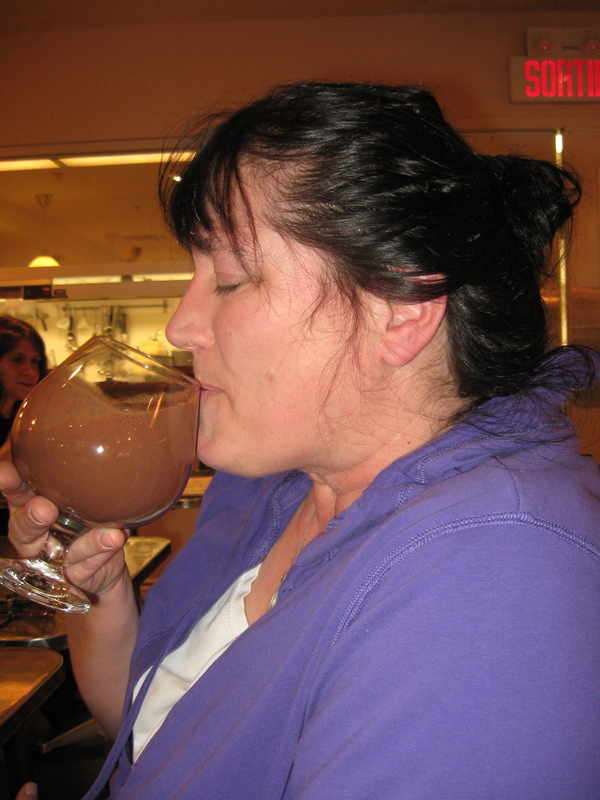 Juliette et Chocolat sounds amazing and that chocolate drinks looks crazy decadent! Yum! Absolutely, Melissa! Montreal has some terrific chocolate creations worth seeking out. Thanks for dropping into the blog.